I am the author of two recently published books, The Book of Origins and Born in the USA. 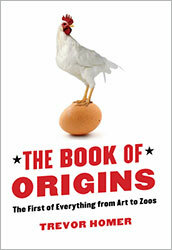 The Book of Origins, my first published book, was based on a lifetime’s fascination with the beginnings of everything. Well… almost everything. Back in the 1950s, a very convincing salesman managed to swamp Walsall in Staffordshire, with subscriptions to a children’s encyclopaedia, with extracts of famous fiction thrown in. The whole encyclopaedia came in twelve monthly parts, and a dozen or so of my pals and I, were the lucky recipients of our parents’ far sightedness. In a know-it-all, unofficial way, we kids formed the GP Club at school, which spent the occasional break-time swapping ‘did you know?’ facts from the books. Everyone knew how a spectroscope works, who did the murder in The Speckled Band by Arthur Conan Doyle, and who discovered America (or so we thought…!!!). Reading those books stimulated my never-ending curiosity, and taught me to hold a healthy scepticism about ‘received wisdom’. The Book of Origins sprang from that scepticism. NOW OUT IN PAPERBACK AT JUST £8.99 IN ALL GOOD BOOKSHOPS. Years of research in the British Library, and a trawl through the world’s best reference books, went into writing The Book of Origins, and it has been the culmination of a lifetime’s passion for seeking out the origin of things. The Book of Origins has now been sold into the USA, Canada, Australia, New Zealand, Italy, Portugal, Bulgaria, Greece, Turkey, Russia and China. 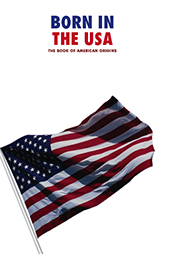 My second book, Born in the USA, was published in New York by Skyhorse Publishing, one of the most dynamic independent publishers in the USA. With only around 5% of the world’s population, and more Nobel prizes in the field of science than all the other countries put together, the surprise to me was that this book hasn’t been written before. Born in the USA is a great patriotic blast about ‘things’ that began life or were pioneered in the USA. With a bit of artistic licence, ‘things’ also includes people. There are influential writers like Ernest Hemingway, John Steinbeck and Jack Kerouac, and musicians such as Bob Dylan, Buddy Holly and Leonard Bernstein. Incidentally, as Bernstein’s funeral wound its way through downtown Manhattan, all the hard-bitten construction workers removed their hard hats and in a moving tribute to the man that did so much to popularise classical music, shouted “Goodbye Lenny”. I feel this small act symbolises the pride Americans have for one of their own, even when that person may not have a direct bearing on their lives. Chapters in Born in the USA include (obviously) Space, Science and Technology, Sport, Leisure and Clothing (jeans, Stetsons). Not so obvious - we have Religions, Fashion, Food and Sayings (‘OK’; ‘yuppie’; ‘cool’). Also not so obvious is that the concept of Father Christmas as a jolly rotund fellow with a white beard was Born in the USA. Born in the USA was launched on the Fourth of July (obviously). I was born in the Black Country (mainly Staffordshire) and grew up in Walsall in the 1950s and ‘60s. I won the British Amateur Golf Championship in 1972 and 1974, and was selected to represent England and Great Britain, in every match that was played in those three years. I was also in the team that won the European Championship of 1973. On the back of that amateur success, but in one of the worst decisions of my life, I decided to try professional golf. After three painful years traipsing round Europe, America and South Africa, plying the trade of a touring professional, with nothing but debts and a suntan to show for it, I re-entered the real world of business and bringing up my family. Since the dark days of pro golf, my business ventures have ranged across property development, handcuff manufacture (don’t ask), spectacle manufacture, automobile sunroof manufacture and half a dozen other diverse commercial enterprises, some of which were more enterprising than commercial. Nowadays writing occupies almost all my time. I am married to Susan, and we have two sons, Max (34) and James (30), both of whom are now carving their own enterprises in the world.